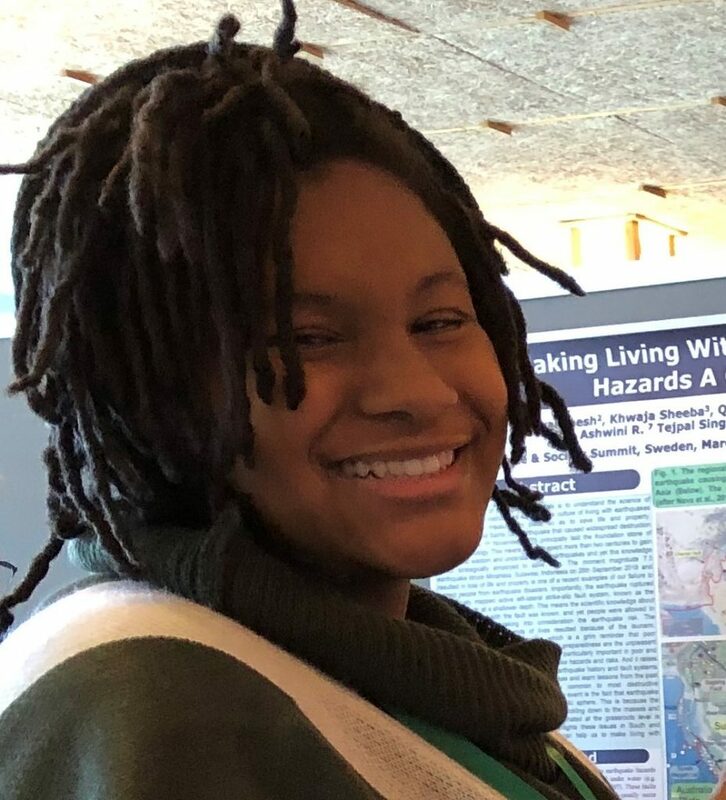 N’taaliyah Banks, a high school senior, is one of the young ladies who recently participated in the Girls United For the Earth’s (GUFE) presentation in Stockholm, Sweden at the American Geophysical Union’s international Geoscience and Society conference. We are excited to share her reflections before the trip! It is something of a curious word, one reminiscent of chlorophyll and warm summer winds, spindles of silky threads bound to bugs tinier than the sounds of human footsteps, of bread, rising in the heat. When applied to me and how I view my life and progression throughout my teenage years, is something of a difficult topic to explore because of its gradual nature, my high expectations, and stifling perfectionism. When I think of what helps me grow, I think of learning, the tool to solving problems and granting efficiency to the mind and soul. One thing about me, one wonderful, beautiful thing that I am happy to wrap up in my arms and nurture until I meet my demise, is my willingness to learn: my thirst for knowledge. My curiosity about the world around me has helped me expand my knowledge, and therefore foster a better understanding of myself. From there, something amazing happened. I was not truly aware of how the opportunities that came with participating in GUFE and having a mentor like Sarah would impact my future. I liked meeting with this group, there were a lot of familiar faces, and we got to talk about how to better our communities with our knowledge of environmental science. Eventually, this led me to become less… reclusive; more comfortable with being outside of my shell of comfort. Speaking with less awkwardness and fear, something that became foreign to my tongue as I emerged from childhood into my teenage years, became something brimming with possibility. I saw my views of Paterson change into something more appreciative, in contrast with how I used to go along with the negative connotation my home is often regarded with. By the end of my junior year, when Sarah selected me to intern at the GFSS Program, I was shaking in my boots with excitement and fear. I’d never had the responsibility of such a leadership role… what would be the consequences if I messed up too badly? How do I actually make sure I’m doing my best? The tremendous support from the rest of the staff and the lessons the younger kids themselves taught me moved in conjunction to push me into an even more comfortable space. I’m not afraid of leading and offering guidance, and when the mistakes happen, you do your best with what you have. Having the mindset of being continuously open to processing and applying new things is key. As of now, I’m entirely excited about going to Stockholm. I see presenting at the conference as a learning opportunity, as new waters to test. I am forever grateful for all of the experiences that being involved in these programs has granted me. We’ll see what’s in store for the future!